John Bell Young begins Beethoven’s Symphonies by proposing to change his tune. Instead of his usual technical jargon, Young offers to follow the melodies and rhythms.In the first installment of the Unlocking the Master series, he approaches Beethoven’s nine symphonies methodically. Each symphony has its own chapter and each movement has its own section. True to his introduction, Young spends the majority of the text explaining shifts in tempo, form, and key signature. This information is important to understand the symphony, but it lacks deeper analysis that would articulate the wonder of Beethoven’s music. The meat and potatoes are there, but where’s the flambé? Young’s book makes up for its analytical gaps by introducing the reader to the world of classical analysis. While discussing the symphonies’ history, Young references important works from Theodor Adorno, Heinrich Schenker, and Leonard Bernstein. The book also gives essential historical context to the compositions and performances. 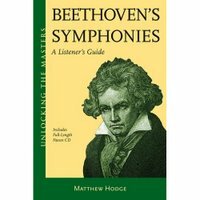 Although Beethoven’s Symphonies lacks analysis, with the CD of excerpts it makes a fair introduction to Beethoven’s symphonies and the wide world of musical appreciation.